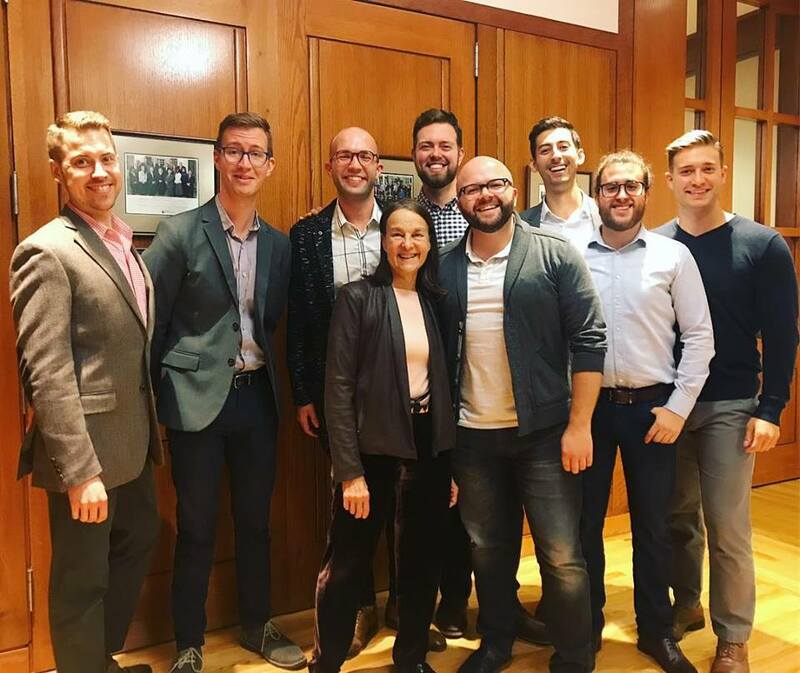 This September, Cantus premiered a brand new work from composer Libby Larsen at Penn State! The multi-movement work was commissioned for Cantus by Music Accord, a commissioning consortium of classical music’s top presenting organizations, and appears on Cantus’ program Alone Together. In his landmark book, Keeping Together in Time, William McNeill convincingly states that its our natural condition, as humans, to create and sustain human community. We share feelings, we keep together in time through coordinated movements, like dancing, making music, marching, group exercising, attending community events, celebrating birthdays and holidays, we create groups, clubs, political parties, religious affiliations… All these human efforts, and more, are powerful forces in holding us together. Yet, we are alone, ultimately, living the paradox of being alone together. YOU – is a musical essay on the human condition of being alone together. It’s about us and we are its theme. YOU are the subject and recipient of its message. Cantus is our essay’s narrator. For the libretto, I identified nine words which describe being alive – You, here, now, who, are, where, know, need, love – and used them to frame questions about being human: Am I fated? ; What is my meaning? ; I need! ; Am I safe? ; Am I secure? ; What is the center of my spirit? Then, drawing on poetry of Emily Dickinson and Edna St. Vincent Millay as muses for these questions (Dickinson’s You cannot put a Fire out – fate, I’m Nobody – Who are You? – meaning, Wild Nights! – need; and Edna St. Vincent Millay’s First Fig and Thursday – security), I created a loose narrative for my essay – I am unconditionally alive…I feel out of control…Who am I?…I need physical human contact…I need security…what is security?…I am security. I am so grateful to Music Accord for providing the opportunity to partner with the members of Cantus in the process of creating this new work. It has been a rich and rewarding fabric of creativity!